Super Spike Vball+Soccer original NES Nintendo Game cartridge only - Cleaned Tested and Guaranteed to Work! Two Awesome Games in One Cartridge! I absolutely love both of these games. Their both so fun, I can play them for hours. Both have great fast action gameplay with great music. Who doesn't love River City Ransom character's playing soccer? :D Thanks for the great customer service Lukie!!! 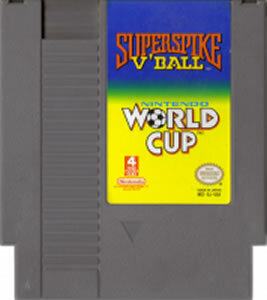 An incredibly fun to play soccer game, Tecmo World Cup has some of the best controls around, with the bicycle kicks, headbuts and feints running around the goalie and past him to put the ball right in the goal, you will only get more and more addicted to this simple yet enticing game. 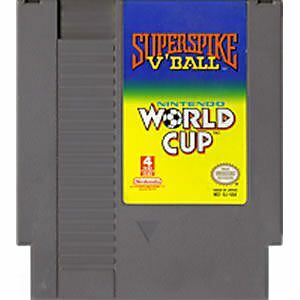 SuperSpike V Ball in addition is a nice addition, but World Cup seals the deal in my opinion. There are special kicks for each team and the difficulty level can be adjusted by disabling help from your teamates, Other Tecmo games featuring the same characters: - River City Ransom - Super Dodge Ball - Hit the Ice (Hockey/RPG) Gotta find 'em all as they are 4 of the best NES games. You won't be disappointed!